A real biryani is a traditional measure of skill in the Indian kitchen – everyone has got their own style and everyone’s grandma makes ‘the best one’. This recipe avoids the culinary stress while still giving you a biryani-style experience. For a veggie-only variant (a great dish to clear out the fridge in one go! ), double the veggies and raisins, add a few carrots and increase the cumin very slightly. Serve the veggie version at lunchtime with yoghurt and nuts. For some flair at a dinner party I like to fry off an onion slowly until soft and then on a higher heat until browned, adding some raisins and cashews to sauté at the end. Use to garnish the top along with some extra fresh herbs. Heat 1 tablespoon of the ghee in a large ceramic-lined or seasoned cast-iron frying pan. Add half the lamb and brown it all over. Remove and repeat with the second batch. Set aside. In the same pan, melt the remaining ghee over a medium heat. Sauté the coriander seeds, peppercorns and cumin seeds for a few minutes until they start to pop. Add the garam masala and turmeric and sauté for a few minutes. Add the ginger and leek and fry for a minute before adding the lamb, salt, cardamom, bay leaf, cinnamon stick and water. Bring to the boil, cover and cook for 1 hour-1 hour 10 minutes. Check that the lamb is tender. Add the cauliflower and aubergine, and cook for another 10 minutes. Add the peas and raisins. Preheat the oven to 200C (fan 180C/ gas 6). Grease a large lidded baking dish (around 25cm x 40cm in size) with butter. 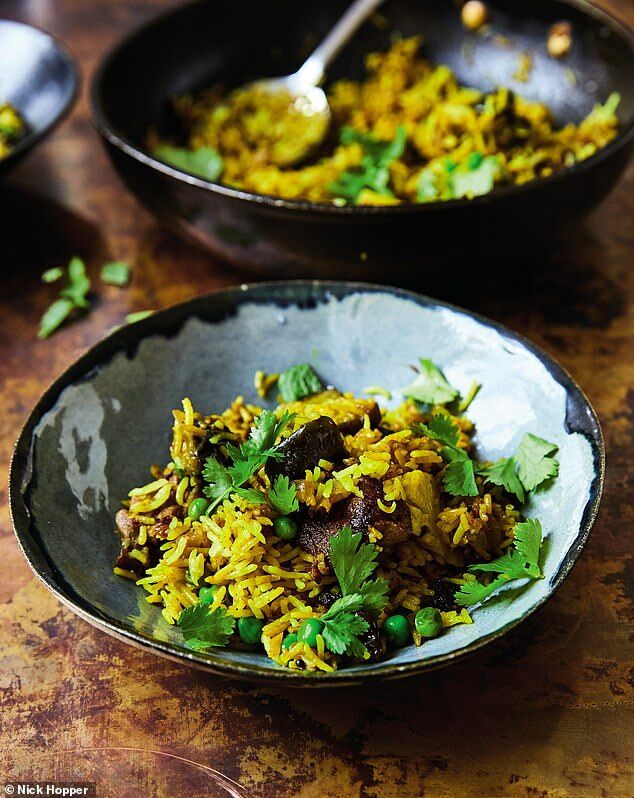 Spoon in one third of the rice, cover with half of the lamb curry and sprinkle with half of the fresh coriander or mint. Repeat these layers again. Finally, add the remaining rice to the dish and dot with a little more butter. At this stage, the dish can be refrigerated for a few hours, then cooked when you’re ready. Place in the oven and heat through for 15 minutes if it is freshly prepared, or up to 40 minutes if you are cooking from cold. Serve hot, garnished with extra coriander and mint. 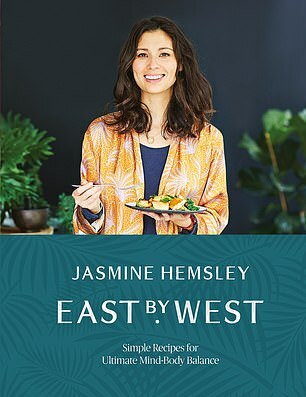 East by West by Jasmine Hemsley is published by Bluebird, price £25.